Property Size 2,650 sq. ft. Private and spacious home with pool. Home is situated on a lot with two sides of deep waterfront dockage. Two kayaks included. Fantastic location for all your boating needs. 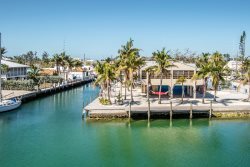 Boot Key Harbor is at your doorsteps with waterside restaurants, Sombrero Reef for snorkeling, fishing under the 7 mile bridge. Spacious and modern kitchen, open floor plan/ Parking for up to 4 cars plus a trailer. Look no further. You will be comfortable here!